From public art installations and a burgeoning community theater scene to a major Strip resort celebrating visual art from top to bottom, there’s no denying that culture is not only alive and well in Las Vegas, but in fact, the city is rolling in it. If you’re looking to inject a little high art in between your high stakes, we’ve curated a list that’ll satisfy your cultural cravings and leave you raving about art galleries as much as that killer paella at Jaleo. Did you know Las Vegas has an entire neighborhood devoted to the arts? We sure do. Home to a monthly celebration of arts and culture called First Friday (we’ll let you guess when that happens), the 18b Las Vegas Arts District is packed with art galleries, vintage shops and community theaters (more on this shortly). Visitors are welcomed to this downtown cultural hub by the Paintbrush Gateway–two giant, glowing paint brushes designed by Dennis Oppenheim. Here, you’ll find independent coffee shops like Vesta Coffee Roasters (which roasts its own beans) and the hip Makers & Finders (which should be called “Movers & Shakers” based on its clientele), as well as several popular bars—including ReBar and Velveteen Rabbit—that regularly feature live music and spoken word performances on their respective stages. These days, the Strip is lit with giant, animated LED screens that rival those found in Times Square, so you might be wondering what happened to all those colorful neon signs that used to beckon travelers into myriad gambling halls. Wonder no more: Most have found a new life at the Neon Museum, located just north of downtown Las Vegas. The two-acre attraction includes the Neon Boneyard, an outdoor space featuring more than 200 restored neon signs from Las Vegas’ past, as well as the newer North Gallery, which houses 60 more recent additions. You’ve got to book a tour to explore the museum—and pay a small entrance fee—but it’s worth it to experience this unique look into the city’s radiant history. Inside and out, The Cosmopolitan of Las Vegas is loaded with surprises for curious eyes. It starts at the top of the Boulevard Tower, where an LED screen known as The Beacon displays digital delights that can be seen from miles away. The resort’s lobby is home to an array of digital columns that features commissioned art from the likes of Sarah Rara, Yorgo Alexopoulos, and Yoko Ono. Vintage cigarette vending machines have been repurposed into Art-o-Mats located throughout the property that dispense miniature works of original art. And each level of the subterranean parking garage sports murals by such legendary street artists as Shepard Fairey, Curtis Kulig and RETNA. Still want more? French artist Georges Rousse made his permanent public art installation debut inside the hotel’s Strip-adjacent Starbucks location. This optical wonder must be seen to be believed. Vegas is known for its bombastic production shows and resident A-list headliners, but there’s more to on-stage entertainment beyond the big-ticket draws on The Strip. There’s a thriving community theater movement across the Las Vegas Valley, centered around a number of tiny performance venues with big ambitions. Check out Chinatown’s Las Vegas Little Theatre—the oldest in Las Vegas—whose dual-theater venue hosts popular plays and musicals as well as new works by up-and-coming playwrights. Or head to the Arts District, where you’ll find a few quality options: new-kid-on-the-block Majestic Repertory Theatre, located inside Main Street’s ALIOS artspace, and Cockroach Theatre Company, whose sixth season at Art Square Theatre starts this fall. With the recent addition of multi-purpose performance venue The Space to the scene (located just across the I-15 from The Cosmopolitan), there’s no shortage of live performances to explore. To be honest, there’s art everywhere in Las Vegas, if you know where to look. 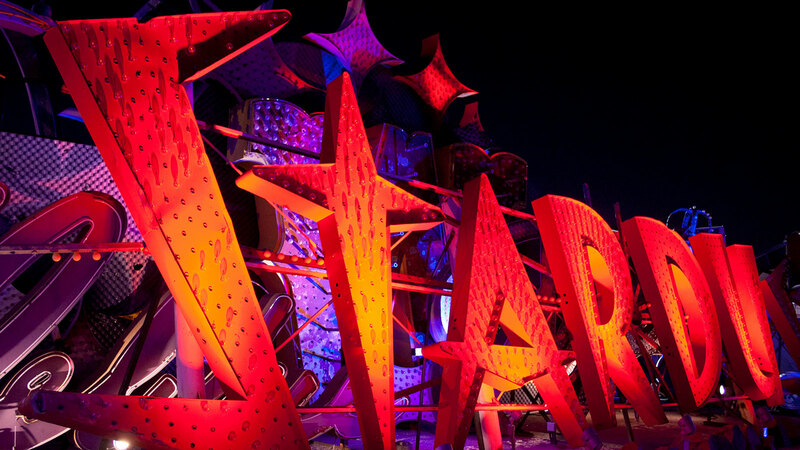 Throughout the resort corridor, you’ll find lit-up selections from the Neon Museum’s Urban Gallery collections. And it’s hard to miss all of the urban murals displayed on a multitude of buildings downtown. The annual Life is Beautiful festival brings in street artists from around the world—including Shepard Fairey, Zio Ziegler and Alexis Diaz—to transform blank walls into colorful works that have inspired people to create their own Instagram-worthy street art tours through the Fremont East neighborhood. And all around town, you’ll find more public art in unexpected places, including dozens of utility boxes along historic Maryland Parkway painted by local artists as part of the Zap! Neighborhood Art program, and a number of three-dimensional installations scattered across the valley’s street medians. Located downtown across the train tracks from Las Vegas City Hall (itself a sustainable work of art with programmable LED lights on its exterior), The Smith Center for the Performing Arts is a five-acre campus housing three theaters in two Art Deco-inspired buildings, in which visitors will also find art exhibitions from museums and private collectors. Works on display include sculptures by Jennifer Main, Albert Paley and the famous lobby sculpture by Benjamin Victor—the youngest artist ever to have a sculpture in the nation’s National Statuary Hall—as well as paintings by Ed Mell, Tim Bavington, and Ellsworth Kelly. The main theater, Reynolds Hall, brings in touring Broadway shows (hello, Hamilton!) and the two smaller venues—Cabaret Jazz and Troesh Studio—offer live music, dance and performance art, as well as symposiums with Las Vegas personalities. Perhaps one of the longest-standing cultural entities in Southern Nevada is the Marjorie Barrick Museum of Art, which has existed in one form or another for more than five decades. Located in the heart of the University of Nevada, Las Vegas main campus, this spot isn’t only educational—it’s also the state’s most important collection house, complete with works formerly found in the Las Vegas Art Museum and the Nevadan portion of the 50×50 Collection from Dorothy and Herbert Vogel. Featuring a mix of contemporary and historic pieces—including artifacts dating back 1,000 years—the museum also offers space to show experimental art and rotating exhibitions. Fun fact: The Barrick’s space was formerly the university’s gymnasium, and UNLV’s original mascot is still visible in the center of the museum’s floor. There are no posts to load at this time.